Neither of us had an inspiration for dinner or felt like cooking much tonight so decided on an old standby, chicken and yellow rice. 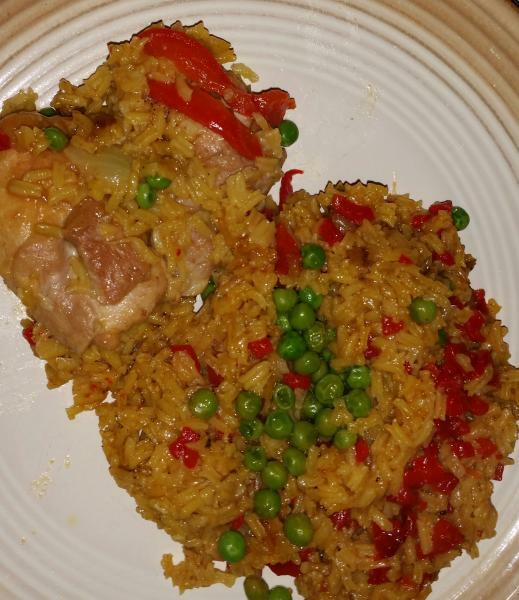 Used the prepackaged yellow rice mix but dressed it up by adding some onions, garlic, additional cumin, pimento and frozen green peas. Pic to follow. Picked up a couple of pieces of fish for dinner. Cod for SO and salmon for me. Some buttered noodles and a veggie with accompany. We have leftover asparagus and cauliflower soups. DH combined them, and liked them together. We also had some potato salad. Burgers on the grill, baked beans, coleslaw. 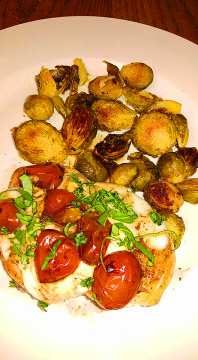 Chicken Caprese w/ balsamic baked brussel sprouts. An exceptionally rare treat for me - I was taken out for dinner. My companion and I shared some marinated olives along with bread and olive oil/balsamic dip. Delicious! After that I had a slightly odd dish that had a succulent chicken breast (hot) in a lovely Thai sauce (hot in both spice and temperature) on top of raw carrot slivers (cold) and roasted squares of sweet potato (hot) and sugar snaps (hot). The chicken was really lovely and the sauce was just the right side of hot without burning your tongue to within an inch of it's life. The raw carrot was just weird, as was the sweet potato. That said, my companion was lovely convivial company and I had a lovely evening. I had take out lasagna for dinner this afternoon, and had about half of that with some sliced cucumber and fresh picked tomatoes from my little patio garden. My daughter, SIL, and 3 little grandsons are coming up for a day visit tomorrow morning from the Santa Clarita Valley, so the kitchen has been cleaned and closed since around noon today. Dx called a bit ago and asked if I wanted to come over for a treat. I said sure, be right there. She made a home made sausage onion mushroom olive pizza. And the treat was a blueberry / banana / strawberry smoothie with her first batch of homemade yogurt. The plain yogurt itself is very tangy, more like a sour cream taste and the consistency of buttermilk or thick cream. Very good in itself and we can see all kinds of ways that can be used. DH played golf with friends and then they went out to dinner. I had leftover beef ragu and polenta.